pre-game warm-ups with the ECHL’s Ontario Reign. LOS ANGELES AND ONTARIO, CA — For Los Angeles Kings goaltender prospect Jean-Francois Berube, the 2012-13 season was a step forward, but at the same time, it was also a mixed bag. Indeed, Berube’s regular season numbers with the Ontario Reign (Kings’ ECHL affiliate) improved, year-to-year, but he played in considerably fewer games. 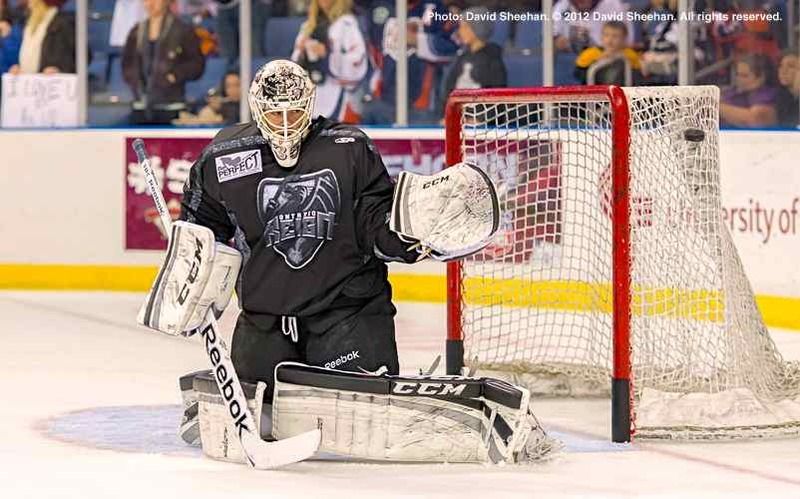 To illustrate, Berube, 22, played in 37 regular season games with the Reign in 2011-12, earning a 17-13-3 (and one shootout loss), with a 2.87 goals-against average (GAA), a .907 save percentage, and four shutouts. In the 2012 playoffs, he was 1-2, with a 3.20 GAA, and a .878 save percentage in four games. Last season, Berube played in 24 regular season games with Ontario, earning a 15-6-1 record (and one shootout loss), with a 2.24 GAA, a .910 save percentage, and one shutout. In ten playoff games last season, Berube earned a 6-4 record (two overtime losses), with a 2.07 GAA, a .914 save percentage, and one shutout. Despite the improved numbers, Berube’s 2012-13 season was a mixed bag because his ice time dropped as a result of being called up to the Manchester Monarchs of the American Hockey League (Kings’ primary minor league affiliate) twice, first on January 7 (re-assigned to the Reign on January 17), and again on February 7 (re-assigned to Ontario on March 25). The back-and-forth between Ontario, California, and Manchester, New Hampshire, going from a situation where he was playing regularly to one where he would be mostly watching from the bench, was definitely a challenge for the 6-1, 174-pound native of Repentigny, Quebec. Kim Dillabaugh, who is in charge of goaltender development for the Kings, indicated that Berube made the most of a difficult situation. Even though his numbers with Ontario improved last season, going into the 2012-13 season, the plan for Berube was for him to seize control of the number one goalie position in Ontario. But he was unable to earn enough trust from Reign head coach Jason Christie. In other words, even if you consider the he spent a considerable amount of time with the Monarchs, it is clear that Berube was not consistent enough with the Reign to earn the number one spot last season. Mental focus seems to be one area that Berube needs to improve upon. But Dillabaugh indicated that is no different from most young goaltenders. Berube noted that Dillabaugh has spoken to him about that, and other “little things” to work on. Looking ahead, Berube could end up back in Ontario for a third season in the ECHL. He would certainly get a lot more playing time, especially if he can step up, and seize control of the Reign’s number one goaltending position. But there are advantages to moving up to the AHL, even if he would be in a backup role with the Monarchs. That said, the Kings want him to step up and earn the backup role with the Monarchs next season. Giving us readers a chance to know more in depth how a goalie evolves, not just his physical play, but the mental as well.